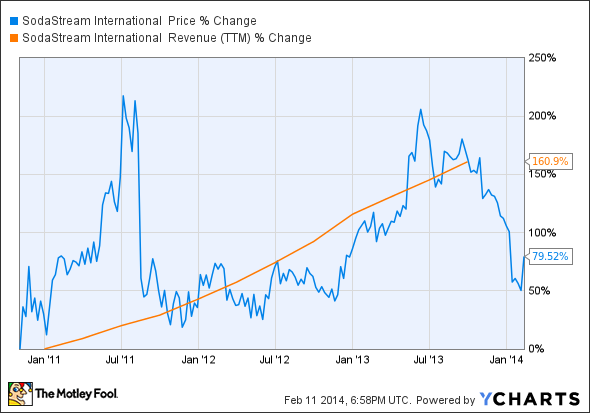 With the Chaos Surrounding SodaStream International, What's an Investor to Do? Boycotts, Coke, Green Mountain, and Pepsi have left SodaStream investors in a dizzying panic. The above chart pretty well sums up Wall Street's manic behavior around the stock of SodaStream (NASDAQ:SODA). The company's shares have been up by as much as 200% twice in the past five years, and have then fallen precipitously each time. Meanwhile, SodaStream the company has continued to steadily grow revenue through its home carbonation devices. The most recent turmoil in SodaStream shares is centered around the company's primary manufacturing facility in the West Bank and news that Coca-Cola has taken a large stake in Green Mountain Coffee Roasters. While these two developments have surely move the stock price downward recently, should long-term investors take notice? SodaStream has had its largest manufacturing plant in the West Bank for some time now, but recent media coverage surrounding brand ambassador Scarlett Johansson has brought the factory and its disputed location back into the spotlight once again. This has led to proposed boycotts by various political organizations. I'm not qualified to comment on the political situation surrounding this particular facility, but here are two articles with excellent investigative journalism from the The New York Times and Gawker to help formulate a personal opinion. What I do believe is that this particular factory may not be around much longer. SodaStream has many facilities, but the primary sites, including the West Bank plant, total 275,000 square feet. The company is building a new factory in southern Israel that will be 915,000 square feet. This makes it three times bigger than all of the existing primary factories combined, and it's doubtful the company will want to keep these other facilities fully operational with that kind of capacity coming online over the next two years. In short, it's probable the West Bank factory won't be doing the majority of SodaStream's manufacturing in the near future. The key term above is "news"; the public has no clear idea what the product will look like, how it will be priced, and how it will perform. Is it good news or bad? I have no idea; that will depend on the customer reaction. Until it launches and customers reviews come in, it seems trivial to devote much time to speculating how this announcement will impact SodaStream. In the video below I'll go over the West Bank factory in detail, review the Coke deal, and give investors some insight into whether they should devote their valuable time to speculating on a possible PepsiCo stake in SodaStream. The Motley Fool's industrials analyst, I specialize in 3-D printing and also do my best to stay up-to-date in the fields of robotics and oceanic transportation. Follow me on Twitter, Google+, and/or Facebook below for the most important 3-D printing industry developments and other great stories.